While multiple routers are already available with 802.11ax, Qualcomm now announces an 802.11ax network chip that can be used for mobile devices, the successor towards 802.11ac could double or even quadrupling performance compared to AC. The 6th gen WIFI technology combines the two and current 2.4 and 5 GHz frequencies, and in theory, could achieve a proper 1.8 Gbit/s. The Qualcomm Atheros WCN3998 is compatible with the 802.11ax standard, it seems to be a serious improvement in capacity and range, doubles network throughput whilst offering to reduce power consumption by almost 67% on 802.11ax. Something else has surfaced in the press release though, there will be WPA3 support as well as Bluetooth 5.1. With WPA3 your WIFI connection in public networks will be better protected like vulnerabilities like krack (which was patched for Windows a long time ago already btw, so do not be worried). The standard over time will replace WPA2, a near-two decades-old security protocol that's built in to protect almost every wireless device today -- including phones, laptops, and the Internet of Things. WPA3 employs individualized data encryption, which scrambles the connection between each device on the network and the router, ensuring secrets are kept safe and sites that you visit haven't been manipulated. Another key improvement in WPA3 will protect against brute-force dictionary attacks, making it tougher for attackers near your Wi-Fi network to guess a list of possible passwords. Qualcomm Incorporated (NASDAQ: QCOM) through its subsidiary, Qualcomm Technologies, Inc., today introduced the industry’s first integrated 2x2 802.11ax-ready solution for smartphones, tablets and notebooks, bringing the most critical features of 11ax to original equipment manufacturers (OEMs) in advance of full standardization and certification. The new Qualcomm Technologies’ WCN3998 solution for client devices will significantly increase security through support of the WPA3 security protocol, making Qualcomm the first company to implement advance security features in 11ax solutions. The WCN3998 will also enhance the Wi-Fi experience, by doubling the network throughput and reducing Wi-Fi power consumption by up to 67 percent, as compared to previous generation 11ac Wave-2 solutions. The WCN3998 features advanced 8x8 sounding, providing up to 2x increase in network capacity when compared to other devices only supporting 4x4 sounding. It can improve the connectivity experience for virtually all users, through its downlink MU-MIMO that is designed to allow multiple users to be simultaneously connected to an access point. Qualcomm Technologies has more than 1,500 device design wins for its MU-MIMO client solutions. Specific optimizations such as the Target Wait Time (TWT) and other power-saving features maximize sleep cycles and minimize contention resulting in up to 67 percent reduction in power consumption. Most importantly, the solution supports pre-draft 11ax Access Points (APs) that are targeted to be deployed in late 2018 and early 2019 and is designed to be fully backward compatible. It is designed to also provide throughput increases even with previous generation 11ac Wave-2 solutions, and it works with multi-vendor devices to provide a virtually seamless user experience. Additionally, WCN3998 supports WPA3 encryption, the latest and most secure protocol announced by the Wi-Fi Alliance that provides robust protection of user passwords and stronger privacy in Wi-Fi networks. As both the intensity and sophistication of security attacks continue to rise today, this advanced security capability is critical in protecting the ever-increasing volume and sensitivity of data traffic on today’s networks. WPA3 encryption in the WCN3998 supports robust security protections even when users choose their Wi-Fi passwords that fall short of common complexity recommendations. These advanced security features are designed to enable consumers to use their smartphones to quickly configure their IoT devices to work on their home network. When using devices in public or open networks, users will also enjoy stronger data privacy protections, by receiving individual user encryption. Beyond traditional Wi-Fi networking, today’s platforms are also increasingly differentiating on high quality audio and voice as a primary user interface. To intersect with these emerging needs, the Bluetooth core in WCN3998 has been completely re-engineered to support Bluetooth 5 and anticipate possible enhancements in the Bluetooth standard. When paired with a device based on the Qualcomm Technologies’ QCC5100 Low Power Bluetooth SoC, announced at CES 2018, it is designed to enable the next generation of “true wireless” Bluetooth headsets that eliminate wires, improve audio robustness and quality, improve the user experience, and improve battery life by up to 75 percent. The design supports Bluetooth Low Energy (LE), taking into consideration the ever increasing need for lower energy applications. Instead of working on new chips they better first to fix their Windows 10 crapware driver. One is software dev, the other is hardware dev. Both fall into different departments, so I see no issue here at all. So, which models have issues under Windows 10? Nearly all popular models - QCA9377, AR9485WB etc etc. All desperately BSODing in Windows 10. 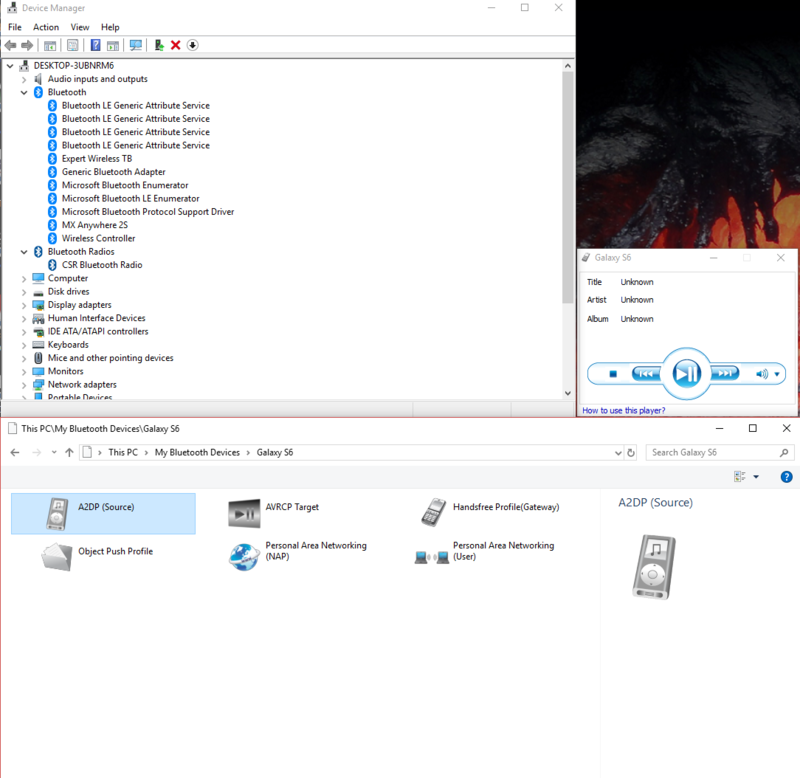 Anyone able to stream music from his phone to PC?